AFC - 07/28/07 Citizens of Rijeka, do not Abandon Animals! In Croatia, every year before the summer holidays thousands of companion animals are abandoned. Most of them end up killed by cars or die of exhaustion and hunger; often they are even abused. The citizens of Rijeka often have shown such terrible recklessness, leaving their animals in the street, tied at someone’s doorstep, or to the mercy of overcrowded animal shelters. In Rijeka, this problem is becoming acute. The few animal shelters are overcrowded, the streets are full of abandoned animals, and the responsible citizens who find an animal are often unable to adopt it. Moreover, the number of abandoned animals is rapidly increasing because of the fact that people often do not spay/neuter their animals, which usually ends in abandoning the offspring right away or giving them away in careless hands. 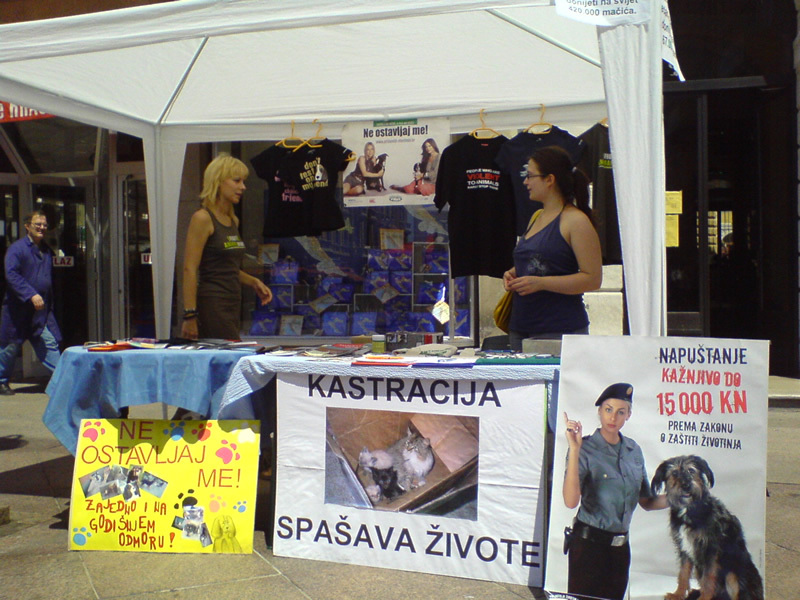 For this reason, Animal Friends Rijeka branch is organizing an info stall on Saturday, July 28 from 11:00 A.M., where citizens will be able to find out more on the culpability of animal abandonment and the alternatives, as well as to obtain contact addresses of institutions in Rijeka and its surroundings where companion animals can be temporarily accommodated. Moreover, Animal Friends will inform the citizens on what to do if they find an animal and how to adopt it, as well as on the necessity of spaying/neutering and microchipping all dogs. Several abandoned dogs looking for a new home will also be briefly present at the stand. This is the sixth year of the campaign against abandoning animals, organized by Animal Friends, which did everything in its powers in the previous years to inform the citizens of Croatia about the possible alternatives to animal abandonment. It is precisely because the citizens' recklessness has not diminished and numerous companion animals are still abandoned every year, that Animal Friends will continue with their activity in Croatian towns in order to improve the situation, namely to lower the numbers of abandoned animals and to increase their welfare.